Making it, In High Heels and Diaper Bags | a Mommy and more………..
I’ve been posting on Facebook some of the pictures of my dinners. First, because I’m proud of how delicious my food is, and second, it’s fun. A lot of my friends have been asking for my menus and grocery list. So last night, I thought I’d give it a shot. Now, heading into this, know that I eat a lot of leftovers for lunches, I’m not a big breakfast eater and that’s okay. I also want you to be aware that my grocery list probably don’t have all of the items from the recipes on them, because I’m not going to buy something I already have in my pantry or freezer. Most of my recipes will be Paleo or Paleoish. It’s how I like to eat. Now, I don’t send my kids lunches that are Paleo, but they eat my Paleo dinners and do so without (too much) complaint! This should get you started though. Oh, and since we aren’t home seven nights a week, I don’t plan seven meals. I used to buy seven dinners worth of food, but too much was going to waste. Now it’s usually four dinners planned, and if I’m hungry when I get home from one of our activities, I’ll wing something, I’m a fan of steaming broccoli and heating up a sausage link. I also want to add that when I’m at the store, if one of my staples is on sale, I stock up on it. I have a spice cabinet full of wonderful spices. Your grocery list, especially if you aren’t an established home cook, might have a lot more ingredients. I can generally go to the store, get enough food to feed my family of five for a week for around $150. Usually a little less, every now and then a little more. That is breakfast and lunch for a week and 4 dinners for five people. It comes to about $1.80 per person/per meal! And that includes the extras I buy at the grocery store to round out my pantry, not too shabby! My What’s For Dinner This Week Pinterest board changes weekly and is where I pin my recipes I plan on cooking. That way when it’s time to cook, I know exactly where to find my recipes. Thursday – Mac and Cheese with Broccoli and Fruit. Saturday – Buttermilk Pancakes and Bacon. So what I’ve done for the list is break it up into two parts. One will be what I need to buy for dinners (again, read the recipes to see if you need any spices or staples that I already have) and the other will be what I need to grab for the kids’ lunches this week. And, of course, when I go to the store, I grab stuff to round out breakfasts. I still have a ton of fruit in my house this week, so my list is light on fruit, even though we are planning on eating a lot of it. Please let me know if you have any questions! I’d be happy to expand on any of the above! I’m just a mom who work 40 hours a week, runs her kids to multiple activities, goes to meetings for the school and service organizations, and wants my home life to be easier. By doing my meal planning, I’ve noticed I’m not frazzled when I get home trying to decide what I can feed my kids that is healthy, but I also save a bunch of money! So I had a couple cheats this week. I got some GREAT news on Monday. I officially don’t have Hodgkin’s Lymphoma anymore. I still have to deal my thyroid issues, but that will be behind me soon and I’ll be on my way! I’m down 1.6 pounds for the week, which even though it doesn’t feel like a lot, at least it’s a loss! And, I’m down another 1.5 inches. So, not a great week weigh in wise. I don’t really mind though, the milk shake I had was totally worth it! I officially made it one week back on Paleo. I had a couple of small cheats this week, but nothing critical. No gluten. I had a vodka tonic at the company party, and one iced coffee with cream instead of almond milk. Close enough for me. It was a pretty good week overall. I ate some good food, and felt great and am glad that I have the knowledge to be able to start this on a whim rather than waiting until my self imposed start date. The next step, which will be much more difficult for me, is to add back in exercise. I’m tossing around going to a Crossfit class at the gym or just throwing in one of my DVD’s here at home. It will probably be a DVD at home, at least until I get back from my trip to Washington. No since in paying for a membership, then having surgery on my neck and not use it for a few weeks. So I’m giving it a go again. I know it’s happened before on this blog, but it’s time. I’m back to paleo this morning. I was going to wait until January 24th to start the process, but honestly, I’m feeling ready now. I’m feeling pudgy and fat and not happy. I know that spending some time on the paleo diet will get not only my weight back where it needs to be, but fix my insides. If I want to be honest, I probably should have been paleo the entire time I was fighting cancer, but really, I think I deserved the cookies and bread and candy. The stats aren’t pretty. I’m starting this at 202.4 pounds. Ouch. 52 pounds to my goal. Or a size 8. I’d be happy with an 8. I know that life isn’t about what you weigh, but I need to stick around for a long time. I took the plunge today. I did some freezer crock pot meals. I made a menu plan. Made the grocery list. Hit the grocery store up. In a little more than three hours, I had successfully shopped, chopped, and bagged ten meals. That’s ten meals that all I have to do is throw the bag of delicious goodness into the crock pot and leave for work and dinner is ready. It really is something how setting aside the time can make you feel so much better. It’s always like that when I plan. I feel better, I’m more confident, and I’ve saved money. Since I’m talking about planning, I’m also planning two trips this year! I’m so excited. The first one is to Seattle. I’m going to watch some of the local fire department do a stair climb. Matt and I will fly first to Walla Walla where we’ll see a friend of mine, then we’ll rent a car and drive over to Seattle and stay with different friends, eat at amazing restaurants, and have a great time! I’ll be 9 days post surgery, and a little sore, but totally worth it. So, it will be an expensive year, but at least this time I’m spending the money on trips instead of medical bills! I don’t do New Year’s Resolutions. I find I don’t keep them. I’m not interested in it. It’s something that feels unattainable and that I’m putting too much pressure on myself. This year, I am not doing a New Year’s Resolution, but I am trying a couple things. I’m trying Project 365, and I’m trying the ‘One Word’ approach. Picking one word to apply to my life this year. So today, when they inspiration word of ‘resolution’ came through I knew that it was going to have to be my one word related. However, ‘patience’ is sort of hard to photograph. I thought about it, and really came to the conclusion that I would print the word out on paper, and photograph that. Then, I was having a crap day at work. Things were not going right. I was in a blah mood. So I shot out of work and went to the beach. It was a beautiful sunny day, and there wasn’t a wave anywhere. 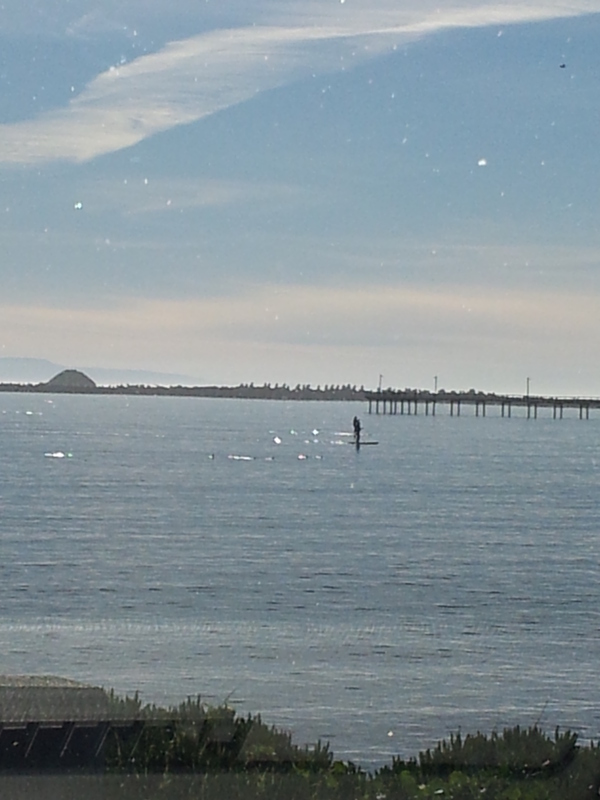 Then, I saw three people way out on paddle boards. I don’t live in an area where we see a lot of that, and I thought, how perfect. Patience is required to paddleboard. I needed the patience to sit out and enjoy the beach. So, that’s my picture.